To have an engaging performance review and collect quality feedback, you need to ask good questions. That's why Question Sets play such an integral role in doing a review with your team. While we added the templates with best practice questions, you can also create your own sets to adapt the feature to your specific process. What is a Question Set? set and choose, during the review creation, what review type they should belong to. To create a new Question Set, click on 'Performance' in the menu list on the left-hand side of the platform. On the next page, go to the 'Question Sets' section. Next, click on the 'Create New Question Set' button to begin. 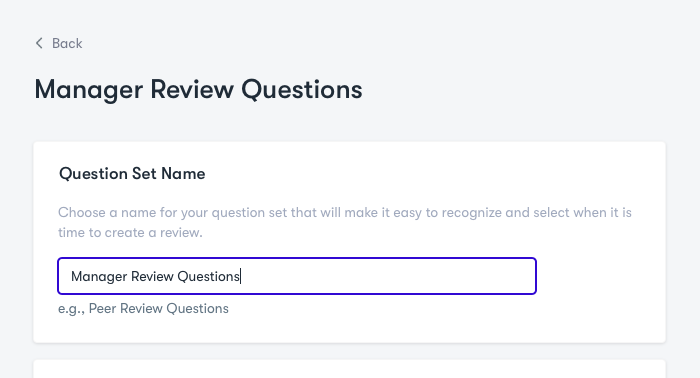 First, choose a name that will identify your question set and make it easier for you when creating a Review. It could be a set based on the review types (manager, peer, self), or a generic template that would work with all of them, or anything else that suits your process. Second, add the questions that should be part of this set. Simply click on the '+ Add a question' button in the next section on the page to add one. Tip: You can re-order the questions by clicking and dragging on the '==' button on the right-hand side of the question field. You can delete a question by hovering over the question and clicking on the recycling bin next to the question field. Click 'Save' at the bottom of the page to complete the process and add your Question Set to the list of sets you can use in your Review. 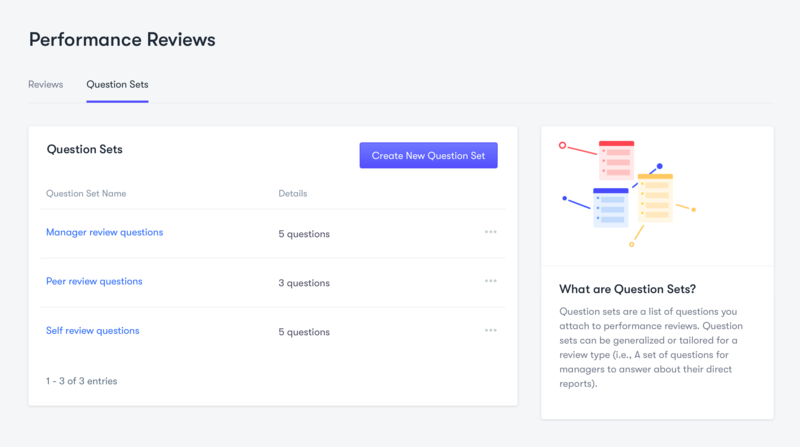 Now you're ready to create a Performance Review and use your own Question Sets to make this experience tailored to your own team!